WASHINGTON — During six years behind bars at Guantanamo Bay, Abdul Rauf insisted he was a lowly Taliban foot soldier who delivered bread and tea to combatants, even though he was really a corps commander. He was released in 2007 and sent home to Afghanistan. Until this week, he was working as the top recruiter in Afghanistan for Islamic State militants. Rauf, who was killed along with seven others in a U.S. drone strike on Monday, and detainees like him who have returned to the battlefield are complicating President Barack Obama's hopes of closing the detention center for terrorism suspects on the U.S. Navy base in Cuba. The administration says the prison is costly, damages America's relationship with key allies and provides extremists a propaganda tool to woo recruits. Obama has vowed since he was a presidential candidate to close the detention center, but members of Congress have thwarted that ambition, saying the detainees would return to the fight. They also have argued that governments where the detainees would be released in the region couldn't be expected to keep track of them and prevent them from becoming active again. Besides Rauf, one or more of the five Taliban detainees swapped for Sgt. Bowe Bergdahl may have already been in touch with members of the al-Qaida-linked Haqqani network. Qatari officials promised to monitor the five former Taliban officials' activities and keep them from traveling outside Qatar for a year. That year ends May 31 and lawmakers are wondering what will happen to them. White House spokesman Josh Earnest has said the five are still in Qatar, but he says efforts to keep them from working with terror organizations "have been updated" to reflect concerns about their contacts. Qatari Foreign Minister Khalid bin Mohammed al-Attiyah said at an event in Washington last week that the five continue to be closely monitored. Those reassurances have not satisfied Republican lawmakers, especially in light of confirmation Tuesday of Rauf's death. "The fact that Abdul Rauf, a former Guantanamo detainee, was acting as a recruiter for IS in Afghanistan underscores the danger of releasing detainees without sufficient assurances that they won't re-engage in terrorism," said Sen. Kelly Ayotte, R-N.H. "I am deeply concerned that if hard-core Guantanamo detainees continue to be released, our service members or our allies may confront them again on the battlefield. 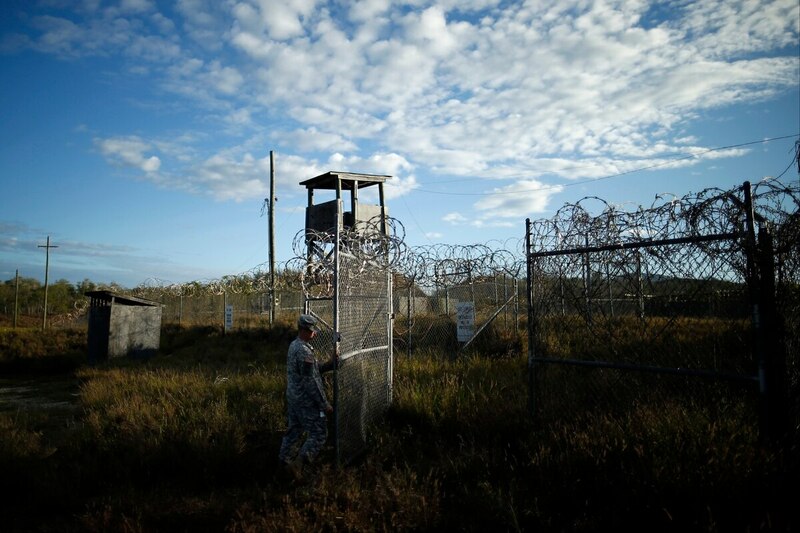 One former Guantanamo detainee returning to the fight is one too many." Pentagon spokesman Navy Rear Adm. John Kirby said Rauf's death by an American drone shows that detainees "return to the battlefield and to the fight at their own peril." Another complication is the security situation in Yemen. Some detainees who won release were sent to Yemen, but the friendly government there was overthrown last week by Iran-backed Shiite rebels, meaning detainees could not be sent there any time soon. On Tuesday the U.S. closed its embassy in Yemen, which also is home to al-Qaida in the Arabian Peninsula. Ayotte and three other Republican senators have introduced legislation that the Obama administration says will effectively ban most transfers from Guantanamo for Obama's remaining two years in office. Brian McKeon, principal deputy undersecretary of defense for policy, told Congress last week that scores of military leaders have called for its closure. He defended the procedures used to review detainees who have been transferred back to their homelands or third countries, saying that each transfer is subject to the unanimous agreement of six officials — the secretaries of Defense, State and Homeland Security, the director of national intelligence, the attorney general and the chairman of the Joint Chiefs of Staff. "Of the detainees transferred during this administration, over 90 percent are neither confirmed nor suspected of having re-engaged," McKeon said. When Obama took office, there were 242 detainees at Guantanamo Bay — down from a high of nearly 800. Fifty-four of the 122 detainees still being held are eligible for transfer to other countries. Rauf, who would have turned 34 on Tuesday, was born in Helmand province in southern Afghanistan, a Taliban stronghold. During the Taliban's rule, Rauf was a corps commander in the western province of Herat and in the Afghan capital, Kabul. "Despite his claims of being a low-level Taliban foot soldier and food supplier, detainee managed to become closely associated with several senior-level Taliban commanders and leaders," according to a 2004 report on Rauf that was in a batch of secret documents about Guantanamo detainees released by WikiLeaks. "After serving three tours with the Taliban, it does not seem plausible that the detainee was not promoted and given a more important duty than a mere bread deliverer." The report said other detainees had identified Rauf as a Taliban troop commander and that he admitted to prison officials that he had been involved in the production and sales of opium and had associated with criminal elements within the Taliban. According to the report, Rauf was associated with former Taliban chief of staff of the army Mohammad Fazl, one of the five top Taliban officials swapped for Bergdahl. Rauf was released into the custody of the Afghan government in December 2007. After spending time in an Afghan prison, he was freed in 2009 and later rejoined the Taliban. Last month, Afghan tribal officials and Western intelligence analysts told The Associated Press that Rauf had become the top recruiter for the IS affiliate in Afghanistan.